For the second year in a row, the Seeker rod company is sponsoring the Fred Hall Saltwater tank. The Saltwater tank is unique. It is a saltwater mobile aquarium filled with nearshore fish like white seabass, kelp bass (calicos), sculpin, rockfish, lobsters, starfish and other species. Filtered seawater must be brought in for this show feature, and it requires a sophisticated filtering system to keep it all running smoothly. A marine biologist is always in attendance. Fred Hall & Associates built the tank about 10 years ago. Seeker has sponsored the tank for two years. It is one of the main seminar venues at a Fred Hall Show, and hourly seminars on nearshore fishing take place at the Seeker Saltwater Tank each day of the show. 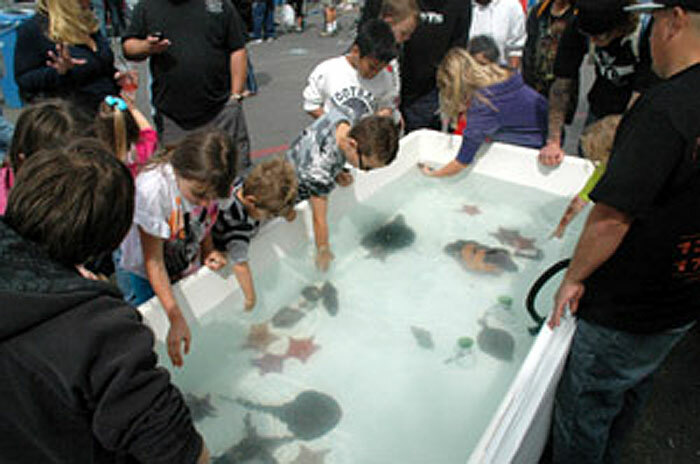 This year, there will be a new feature: a greatly expanded “touch tank” for kids and kids at heart. Marine biologist Mike Abernathy will watch over the tank and make certain everything runs smoothly. It is nearly impossible to walk by the Seeker Saltwater Tank without stopping to look at the fish. While you are there, sit down and catch a seminar or go take a look at the “touch tank.” It’s a lot of fun.